There were mad adventures to be had this weekend, thus no new posts yet. I’ll get caught up in the next few days. 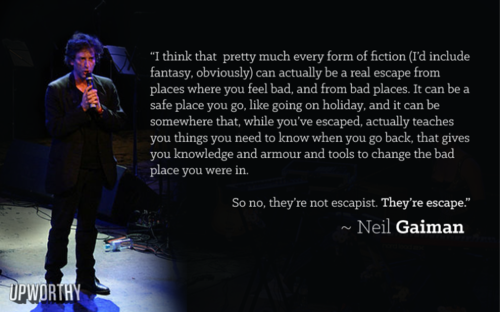 Until then, enjoy this visual of Neil Gaiman’s answer to the question of “Fiction: Escapist?” that I linked to last week. This entry was posted in General Announcements and tagged Coming out of my ears, My Life Will Someday Be a Mind-Blowing Memoir, Neil F-ing Gaiman by Rommie. Bookmark the permalink.